Alex was appointed Global Chief Executive Officer of MullenLowe Group in May 2015, upon the merger of IPG agencies Mullen and Lowe and Partners. Since his appointment, Alex has instituted a global rebranding and repositioning across the MullenLowe Group global network, driving business growth, and creative and effectiveness award success. In the last 18 months, global new business wins include Harley-Davidson (leading IPG’s Team Ignite), Hyatt (global creative AOR), Western Union (global media AOR) and Etihad Airways (global CRM and loyalty AOR). Alex has been with IPG for over seven years, previously serving as Chief Executive Officer of U.S. agency Mullen – one of the most awarded and fastest-growing agencies in the U.S. receiving accolades from the industry’s most notable organisations, including AdAge A-List, Fast Co. Most Innovative Companies in Advertising and Marketing and Forbes 10 Great Agencies. 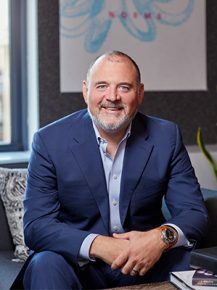 Under Alex’s leadership at Mullen, the agency grew by 76% and added 250+ new employees in four years, while expanding from their Boston headquarters to other key U.S. markets. During this time Alex led successful pitch teams to win clients such as Acura, JetBlue, Zappos, FAGE, U.S. Cellular, Google, and American Greetings. Alex joined Mullen from Fallon, where he was a key strategic leader on brands including BMW, Garmin, Equinox Fitness and United Airlines, which he guided during the post-September 11 period. He’s adept at managing chaos both at work and at home, where he and his wife, Jennifer, are raising three girls and a boy.